White sandy beaches, swaying palms, pleasant weather, vibrant nightlife and sparkling waters are just some of the innumerable elements that attract millions of visitors to this small state every year. Also known as the beach and party capital of India, Goa is one of the most popular tourist destinations in the country. Goa is basically divided into North Goa and South Goa. While North Goa is home to numerous beach shacks, famous clubs, golden beaches and flea markets, South Goa is known for its tranquility and resort experience. If you are looking to experience the authentic Goan life, then North Goa is the place to stay. On the other hand, if you are looking for a relaxing and a peaceful vacation, then South Goa is the place to stay. Also, keep in mind that most clubs, beach shacks and other popular attractions in North Goa are closed during the off-season. If you want to experience the true vibrant lifestyle of Goa, it is best to visit between the months of October and January. Even though Goa is the smallest state in India, it is home to some of the most popular wildlife sanctuaries in the country. Around 20% of the state is covered in wildlife sanctuaries. Most of them are even open throughout the year; however, October to March is the best time to visit them. Some popular sanctuaries in Goa include Bondla Wildlife Sanctuary, Mollem National Park, Bhagwan Mahaveer Sanctuary, Mhadei Wildlife Sanctuary, Cotigao Wildlife Sanctuary and Netravali Wildlife Sanctuary. Many of them even provide accommodation to those visitors who want to stay for a longer period of time. Fun activities such as elephant rides are also provided in some wildlife sanctuaries. Due to its excellent location along the Western Ghats, Goa is home to a wide range of birds and animals. Foxes, Kingfishers, Mynas, Parrots, Wild Boars and other migratory birds are found in the forests over here. Goa is also home to the prominent Salim Ali Bird Sanctuary, located on Chorao Island. Over 1512 plant species, 275 species or birds, 48 genera of animals and over 60 species of reptiles are included in Goa’s rich bio-diversity. Goa is home to some important museums in the country such as Naval Aviation Museum and Goa State Museum. The aviation museum is the third of its kind in India, with the other two located in Bengaluru and Delhi. Another popular museum located in Goa is the Goa Science Center and Planetarium, known for its many hands-on exhibits and practical learning experience. Other famous museums in Goa are Archaeological Museum and Portrait Gallery and Museum of Christian Art. India is a well-known exporter of spices all around the world. It accounts for more than half the amount of total spice exports in the world. Goa is home to many popular spice plantations that can be visited by tourists as well. These plantations provide an insight to how to the spices are cultivated and processed. Many of them even provide lots of fun activities such as bathing with the elephants and a delicious buffet lunch for the tourists. One can find a number of spices and fruits such as nutmeg, cloves, cumin, cinnamon, vanilla, curry, coriander, pepper, banana, coconut, mango, bimbli, papaya, jackfruit, guava, citrus and cashew nuts over here. Some popular spice plantations in Goa include Savoi Plantations, Tropical Spice Plantations, Pascoal Spice Village, Rustic Plantations, Sahakari Spice Farm, Abyss Spice Farm and Sai Herbarium. Due to its rich cultural heritage, Goa is dotted with several beautiful forts. Even though most of these forts are smaller in size as compared to the other Indian forts, the forts in Goa have a lot of historical, political, economical and military importance. Some significant forts in Goa include Fort Aguada, Chapora Fort, Cabo De Rama Fort and Tiracol Fort. Most of these forts are easily accessible through a bus, auto-rickshaw or a taxi. Click here to know more about the famous forts in Goa. Surrounded by the verdant Sahayadri Ranges and the mighty Arabian Sea, Goa is dotted with several waterfalls, springs and lakes of unmatched beauty. Most of them are located far from the shoreline, in the peaceful interiors of the state. The three prime waterfalls in Goa are Arvalam Waterfalls, Dudhsagar Waterfalls and Kesarval Waterfalls. These waterfalls fall from great heights, thus creating a beautiful silver hue of cascading water, attracting thousands of tourists who want to stay away from the hustle bustle of the city. Goa is also well known for its numerous beautiful water bodies. From several beaches to different lakes and rivers, they have become one of the most popular tourist attractions in the state. Mayem Lake, Curtorim Lake and Carambolim Lake are three of the most popular lakes in Goa. All them are located a few minutes drive from Panaji and provide beautiful views of the neighboring forests. Moreover, there are also a number of budget accommodations located nearby for those tourists who want to stay for a longer period of time. Check out Goa's profile page and you can find all about different waterfalls and springs. Owing to its rich cultural heritage, Goa is gifted with numerous churches, temples and mosques. People from across the world come to Goa to visit these famous sites, some of which are many centuries old. On one hand there are churches in Goa that say volumes about the Portuguese rule in the state and on the other hand, there are temples and mosques that portray a completely different story. Each place of worship in the state has its own form of uniqueness and significance that represents the history of Goa. Most of the Goan churches were built by the Portuguese in an effort to convert more people to Christianity. During the Portuguese rule, church building was considered as the top most and primary occupation at that time. They played an important role in the social, cultural and religious life of Goans. Some famous churches of Goa include Basilica of Bom Jesus, Se Cathedral, St. Francis of Assisi, St Jerome’s Church and Mary Immaculate Conception Church. A temple in Goa is known as "Deul" or Sausthan in Konkani language. These temples were once the center of all the villages and towns; however, they were all demolished during the Portuguese rule. Many people still consider Goa as a Christian state, although they do not know that there are many famous temples located over here. Some popular temples in Goa include Shri Bhagvati Temple, Shri Chandranath Temple, Shri Mahalaxmi Temple, Shri Mangueshi Temple, Shri Naguesh Temple, Shri Shantadurga Temple and Shri Ramnath Temple. Mosques in Goa are constructed in a typical Muslim architecture with several domes and pillars. There are around 27 mosques in Goa, out of which The Safa Masjid (Ponda), Jama Masjid (Sanguem), Namazgah Masjid (Panjim) and Surla Tar Mosque (Bicholim) are the most popular ones. With a coastline of almost 125 kilometers, Goa is home to some of best beaches in the country. These beautiful white sandy beaches have something for everyone, from luxurious beach resorts to comfortable beach huts, from fabulous trance clubs to peaceful quiet lounges and from fine-dining restaurants offering international cuisines to affordable beach shacks offering authentic Goan cuisine. Some popular beaches in Goa include Mandrem Beach, Baga Beach, Calangute Beach, Agonda Beach, Candolim Beach, Anjuna Beach, Colva Beach, Majorda Beach, Mandrem Beach and Palolem Beach. Goa is a splendid state when it comes to tourist attractions and you simply cannot miss these 6 attractions while touring the beach state. Goa is known for its one-of-a-kind shopping experience. With several flea markets and night bazaars, shopping in Goa is not only extremely fun but also a completely different experience. Unlike big cities that are known for its malls and branded shopping, Goa is renowned for its traditional and ethnic style of shopping. From beautiful handicrafts, brassware, terracotta, bamboo furniture to fun junk jewelry and accessories, one can find a wide range of products in the many flea markets of Goa. Some popular markets over here are Anjuna Flea Market, Calangute Market Square, Saturday Night Bazaar at Arpora and Mackie’s Night Bazaar. Another popular market in the state is the Mapusa Market, which is known to provide the true flavor of Goa. It is the only market in the state that offers a wide range of spices, homemade pickles, fruits, Goan sausages and much more. Some markets in Goa shut down by sunset, while some start only after 6 pm. Besides shopping, some of these markets like Anjuna Flea Market and Saturday Night Bazaar also offer other forms of entertainment like live jam sessions, dance performers and music. Other than that, there are also a number of stalls offering some delicious mouth-watering Goan food. Goa is not only famous for its beaches, shopping and water sports, it is also known for its various Yoga Retreats and Ayurveda Centers. Most of them are situated in North Goa and are generally open from October to May every year. Whether you want to learn yoga as a hobby or professionally, Goa has many institutes and centers that provide both daily and long term classes for different forms of yoga. Some popular yoga retreats in Goa include Yoga Magic Eco Retreat, Yoga Gypsys, Little Cove Yoga Holiday Retreat, SWAN Yoga Retreat, The Mandala, Purple Valley Yoga Retreat, Ashiyana Yoga Resort Goa, Satsanga Retreat and Oceanic Yoga School. Many of them are located close to the beaches and provide comfortable accommodations as well. Moreover, most of them even provide holistic wellness along with relaxing Ayurvedic treatments and other therapies. As soon as the sun goes down, the party scene in Goa brightens up with every party animal visiting the nearest club in the state. As much as Goa is known for its beaches and food, the local parties in the Goa attract equal amounts of attention. For tourists visiting the state for the first time, Club Titos, Café Mambos and Club Cubana are the best places to be as they cater to both local and international DJ’s. If you are on a budget, then try the several beach shacks and beach joints in Goa, which provide as an inexpensive way of partying in the state. Most of these beach shacks sell chilled alcohol with delicious food and are even open until late in the night. Some popular clubs and pubs in Goa are Kamaki, Club Titos, Club Cubana, Mambo’s, Ozone, Clun Sinq, The 9Bar, Cocktails and Dreams, LPK Waterfront, Cape Town Café and Drift. 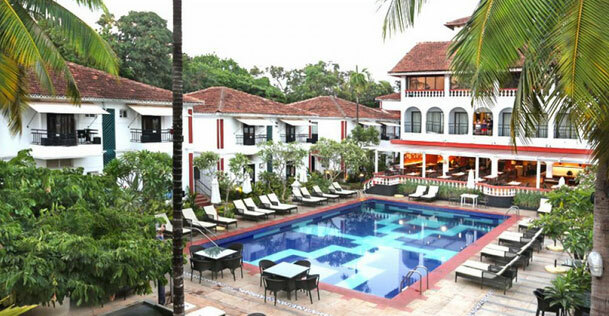 Goa provides a number of options for hotels, guesthouses and resorts for every kind of taste and budget. From simple and bare rooms for tourists on budget to five start luxurious resorts and hotels for the tourists who want to indulge their fancies, Goa has it all. Throughout the year, visitors can find good accommodation in the state, however, during the peak season, between the months of November and January, it is best to book the room months in advance as it can get fully booked really early during these months. Moreover, since this is the time when most foreign and local tourists visit the state, therefore the prices of rooms in Goa also increase. The best time to visit the state is between the months of November and March, when the weather is pleasant and the sea is calm. Moreover, during this period most of the hotels, beach resorts, beach shacks, clubs and pubs are open for business. The party scene in Goa is also high during this time. December and January are the perfect and the most popular months to visit Goa. Winters in Goa are completely rain free with lovely cool mornings and pleasantly hot afternoons. Also, this is the time when most of the popular international and domestic DJ’s visit the state along with grand celebrations of Christmas and New Year’s. From the month of February, the tourists slowly start to disappear and the room rates also become cheaper. From the month of April till the month of June, Goa is very hot and humid and most of the beach shacks and clubs are closed during this time. The monsoon season in Goa starts from the month of June till late September. During this period, most beach huts are closed and the only form of accommodation available in Goa are the hotels and guesthouses. This can also be a good time to visit the state if you are not into adventurous sports or beaches. You can still enjoy eating delicious food at restaurants or vibrant festivals of Goa, but just remember to pack your raincoat. The international airport in Goa, commonly known as Dabolim Airport, caters to the entire state. It is located about 30 kilometers from the capital city – Panaji, 23 kilometers from Margao and just 4 kilometers from the largest town in the state – Vasco De Gama. The airport connects Goa to all the major cities in the country and some international flights as well. Moreover, pre-paid taxis and auto-rickshaws are easily available at the airport. Two major rail lines – South Western Railway and Konkan Railway dominates the railways in Goa. The primary railway station in the state is called Madgaon, located in Margao. Other railway stations like Thivim, Pernem, Canacona and Karmali are also well connected by trains. Major National Highways like 66, 366, 4A, 768 and 566 run across the state, making Goa well connected with other cities. Goa has almost 224 kilometers of national highways, 815 kilometers of district highways and 232 kilometers of state highways that run across the state. While Goa is well connected to other major cities in the country through air, rail and road, it is also well linked internally by an efficient public transport. Taxis, auto-rickshaws, buses and motorcycle taxis are not only easily available in Goa but they are also very affordable for travelling both long and short distances. thanks for the detailed information on goa!! can you suggest me some of the best restaurants in candolim city?